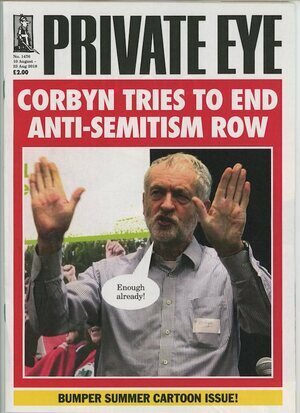 The latest Private Eye . Posted in Misc and tagged Pruvate Eye at 3:53 pm on August 7, 2018 by Bodger. Me too. I enjoyed Corbynmania. Remember that? cramming ‘jer-em-y-cor-byn’ into the riff from seven nation army wasn’t easy, you know. I once bought him a drink to say good luck. It was a Mazeltov cocktail. People keep screaming that Corbyn is antisemitic even though he’s very clearly not, and I don’t really get it. To my mind it’s akin to declaring over and over again that Obama wasn’t born in the USA. Like…he attended the Jewdas Passover seder. Whaddya want?! I think it’s that he’s not strong enough on anti-semitism. I don’t think anyone truly believes he’s anti-semitic. He really should have stamped this out ages ago — it’s not exactly a great measure of him as a leader. Im not seeing anything to label him an anti-semite either. But of course the narrative of the Anti-Defamation League these days is that anyone who criticises Israeli foreign policy is automatically an anti-semite. I think its more a case of the right in the UK being so scared of him in power (and of his popularity) that they need to throw any kind of mud at him in the hope it sticks. His election result and the manner of it (when May was supposed to be a shoe in with an increased majority) frightened the bejaysis out of the right wing media and this campaign against him is the best they can come up with. Either way I doubt the average UK voter really cares in the same way that the Torygraph and Daily Fail do. It wont matter a jot at the next election. Margaret Hodge called him a “a f**king racist antisemite” to his face. Not sure if that qualifies as really thinking he’s a antisemite. Also the Jewish Chronicle, Jewish News and Jewish Telegraph printed the same front page editorial calling him an existential threat to British Jewery. This is an out and out smear campaign against a decent man. They won’t stop until he’s gone. Oh And also, its the old nut of Antisemitism VS anti-Zionist – two totally different things but happily amalgamated for the cause, support Palestine and you get this! I think it’s pretty fair to say Hitler was anti-Semitic. It’s the overwhelming majority of Jews in Britain and many Labour MPs including those who have fought racism all their political careers who consider Corbyn to be anti-semitic. Some of my Jewish friends are in fear of Corbyn getting into power because of the extreme and sometimes violent nature of the people surrounding him. Not that they’ve got anything to worry about – boundary changes happen in the next couple of years that have planned for a very long time and which give the Conservatives a very favourable outcome and that,combined with a new leader by the end of the year,hopefully Boris or the Moggster,will see off any chance the old codger has of becoming PM. Moggster implies he wears shades and a leather jacket at all points. And you and I both know he does not. I’d call that False Advertising. Tell him not to use it as part if his campaign. If you draw eyes and lips on your hands and use voices, like charger does, you have all the friends in the world. White, English ones, of course, none of that foreign muck. It’s all because the Blarites hate him. Nothing more. With you there Star. It was one of his party – a proper smear. Jeremy has upset his Zionist overlords. He has not been staying quiet about Israel’s military aggression of late or when the US moved its embassy to Jerusalem. Now every attempt is being made to get rid of the man. I don’t particularly like some of the man’s views but I do not doubt his credibility. There was a time when anti-Semitism meant someone that blindly hated jews but over the past few decades, it has morphed into a description for someone that the Jewish establishment hates. That’s like saying there was a time when racism meant hanging black people from trees, now it just means calling someone a n*****. I’m don’t know for certain if Jeremy Corbyn is an antisemite or not, but you sure as hell are. With bells on. No it’s not. As you damn well know. You don’t have grasp of what you’re trying to write about. You’re a bigot. If he’s not anti-Semitic why does he hang out with those who are ? Corbyn has too many skeletons in his closet for the British public. IRA sympathiser, Anti-semite, communist. Couldn’t have done more to ensure tory majorities. And yet the Conservatives rely on the DUP to prop up the government. Let’s have the current Irish set-up where all the second-rate politicians are propping each other up. Isn’t that what you have? An incompetent, disjointed conservative government propped up by a bunch of medieval religious fanatics. In Ireland they take months to form a coalition by buying up independent politicians with bribes of funding for pet projects in their constituency which means there is no effective opposition to the government of the day. Think of the DUP as the Healey-Raes of the North. And in the shattered kingdom of Britain when they have no point to make they resort to having a go at the Irish. For all its many faults you don’t see members of the Irish government publicly undermining each other on a daily basis. The Brits can only dream of such stability as they drift aimlessly towards chaos. They don’t undermine each other because they all have their snouts in the trough. The Dáil is nothing more than a rubber stamp for whatever Brussels and more specifically Germany and France tell the Irish what to do. A collection of grasping,self-aggrandising half-wits put in by boggers who’ll sell their soul for an extra bus service. Hahahahah! Struck a nerve did I? Hardly surprising. After all, your empire crumbled as soon as Ireland left and now, with our EU allies, we’ll be watching your economy crumble too. Man,you really are as dumb as a box of rocks. Says the guy cheerleading the race to become a third world country. Your government is so afraid of what will happen if people hear how bad it’s going to get they won’t even release their reports! How’s Brexit going for you, Ollie? He was and has been a longtime supporter of the Blanket Protest and Irish Nationalism; one member of his party had intolerance to the Jewish race; the Labour Party supports a left of centre political stance. I know your comment hints to this. He will never be PM but he’s a great Labour leader. I wish we had his like here. And drifting aimlessly towards chaos ? Blighty has just posted figures that show exports of UK goods and services rose to a record high of £620.2 billion in the year to March 2018. Sterling exports reach record highs. Cian. Stop that logic this instant, young man. Shame Ireland can’t do anything about its currency – that’s for Angela to decide. You’re a regular Vizzini, aren’t you? He was always a favourite of mine. Rees Mogg said it’ll take 50 years to judge if Sasamach is a success and you’re claiming victory before it even happens. Ever heard of Horizon 2020? Finn is from New Left Review , a publication run by Richard Seymour ex- Lenins Tomb. His contribution to the debate on Israel/Palestine was to wish that a Jewish journalist would have his throat cut. Finn wrote – or at least published this article before the revelations of Corbyn’s statements on Press TV became common knowledge. seems rather hasbara-esque of you! Criticism of Israel – considering its continuing breaches of international law and human rights – does not equate to antisemitism whether its Corbyn speaking on PressTV or anyone else for that matter. But thanks for setting me straight on Finn’s contribution to the Israel/Palestine debate. Although, I want to read more about this throat-cutting yarn and nothings coming up in google. You wouldn’t have a link, would you? Fortunately Liability Leo is keeping his trap shut for a while. Negotiations are between the big boys now,not some country yokel who thinks loud socks make him an international statesman. There are no negotiations mushroom boy. The EU are still waiting for the UK to figure out what they actually want. Two years of grandstanding, infighting and u-turns ends up with them being sent back with their tails between their legs by the EU to start again. And all because Ireland out-thought and out-planned them. HAHAHAHA!! !